I’m currently reading The Gene: An Intimate History, a stellar book on the history of genetics. One of the anecdotes in the book, which I really enjoyed, was that Pythagoras—who we know best from the Pythagorean Theorem—also had a theory about birth and heredity. …and as often happens with thinkers, he took this idea to heredity as well, arguing that the relationship of children to parents is like the relationship of the a and b sides to the c side, i.e., fundamentally linked. 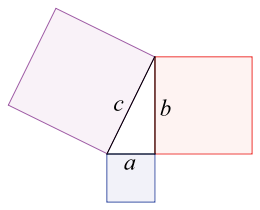 As you can see from the Wikipedia article, there is some question about how much of what’s attributed to Pythagoras actually came from him, but the story is cool regardless. I think it’s interesting when an idea permeates someone’s thinking to such a degree (sorry) that they see the concept in everything.